When you burn our orange flavored incense sticks, you can feel the positivity and an enlightened aura. 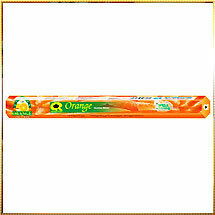 Freshness is the other thing which is duly experienced when fragrance of our Orange Incense Stick spreads in the room. Long lingering effect of these orange fragrance incense sticks give you an uplifted mind, body, and soul for long time. Keeping less fume consumption in mind, we use premium combustible material and essential oil of orange as an ingredient. Methods of preparation is completely traditional infusing purity at all ends. The outcome is less fume and mesmerizing fragrance. Our range of Orange Incense Sticks are available in fancy packets of small and large sizes.